Unusual 1920s Silver Bracelet with Safety Chain [SH7545] - £285.00 : loveVintageDiamonds.com, Your Vintage Diamond Dreams Come True! This bracelet is distinctly a 1920s piece of jewellery, with its unusual 'swirls and balls' design. Made up of six links plus a discreet fastener, its overall length when fastened is approximately 7". In width it measures approximately 5/8 of an inch, and up to approximately 3/4 of an inch when measured from the widest details. 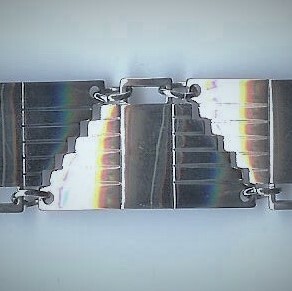 The bracelet also benefits from the detachable safety chain that is already fitted. The overall weight of the bracelet is approximately 40.7gms.